Indian jewelry like mangalsutras, necklaces, nose rings, earrings, bangles and rings, toe rings, bracelets are all part of the Gujarati attire. Most of this jewelry is made in 22 carat gold but cheaper costume jewelry is also available. During weddings, Gujarati brides wear a lot of jewelry, this is traditionally a form of trust handed to the girl as 22 karat jewelry. Years ago, only married Gujarati (Hindu) women wore a red bindi (red powder worn in a round shape on the forehead also found in the form of stickers). These days, most women, married or not, wear 'bindi' as a fashion accessory when they wear traditional Indian outfits. Modern Bindis are like stickers, and are available in various shapes, sizes, colors and designs. Only married women however, wear red powder, called 'sindoor', in a short straight line on the scalp, starting near the hairline and covers the area where the hair is generally parted(middle). During a traditional Hindu wedding, the groom applies 'sindoor' on the bride for the very first time. This act can be compared to a ring ceremony in western weddings. Generally, men wear pants and shirts or t-shirts however traditionally, males will wear dhotis be it every day on a special occasion and a kurta is worn on top. Females will wear saris or something similar. On special occasions females will wear slightly more expensive saris. These traditional garments can be seen both in and outside of India. A famous example is Mohandas Karamchand Gandhi who wore a dhoti. 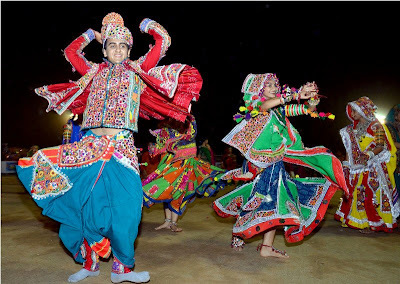 Gujarat's indigenous dress is a cultural expression which has undergone slow modification and yet remained a marker of identity and social unity. 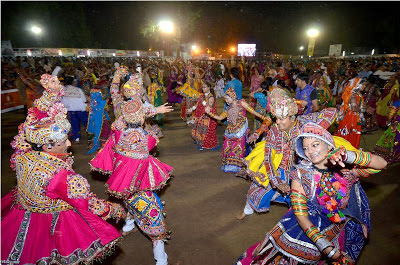 While Gujarat dresses helps demarcate social standing, they also help to bestow a distinctive identity that disappears in the course of cultural integration and racial intermixing. 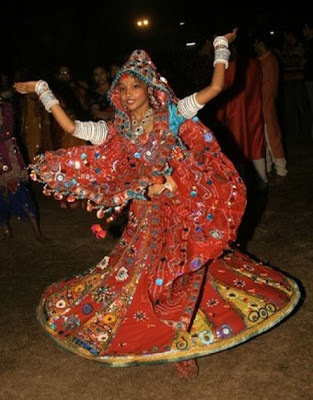 The traditional Gujarat dresses for women consist of the lehenga choli or the ghagra choli. These are colorfully embroidered and complemented by bare-backed blouses extending to the waist. Ghagras or lehengas are gathered ankle-length skirts that are fastened at the waist. 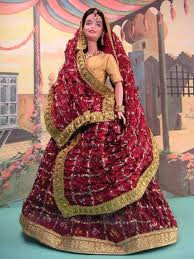 The entire outfit is completed by a veil cloth called odhni or dupatta which is thrown across the neck or over the head. 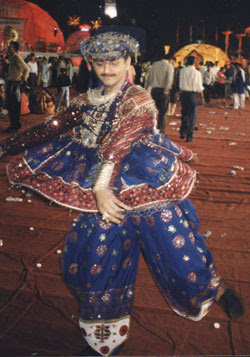 The lehenga choli, otherwise known as the ghagra choli, helps to add vitality and color to the surrounding landscapes. Tribal women adorn themselves from head to toe with chunky silver jewelry besides the Gujarat dresses that are the norm everywhere in the state. The garments of the Parsi women are exactly the same as that in which other Hindu ladies dress themselves except for the very pronounced difference that is embodied in the long sleeves of the blouse and a scarf to serve as a cover for the head. Gujarati men usually attire themselves in dhoti, long or short coat and turban cap. At present, however, pants are becoming more fashionable instead of the conventional dhoti. The usual Gujarati dresses of the women also comprise sari and blouse. Parsi males wear pants, long coat and a headgear. Gujarat dresses are popular throughout India for their bright hues and traditional tinge. We are well known manufacturer’s and exporters of 100% cotton printed Indian Women garments for women.We believe in quality and client satisfaction. Majorly we deal in printed designed cotton dress,cotton sarees, Embrodary dress material and printed bandhni dress material.